One of the oldest wildlife sanctuaries in India, Periyar National Park and Tiger Reserve was established in the verdant stretches of Kerala in 1895 and declared a Tiger Reserve in 1978. The Periyar Wildlife Sanctuary covers an area of 777 sq km, out of which 360 sq km is under thick and dense evergreen forests. Periyar is renowned for its geomorphology, diversity of wildlife and scenic beauty therefore it attracts the visitors from all over the world. This is one of the very few sanctuaries in India where you can have the unique experience of viewing wildlife at close quarters from the safety of a boat on the Lake. An ideal habitat for Indian Elephant, you can see this mighty herbivore living in accord with the ferocious carnivore – Tiger, in the national park. Whereas the wooded hills and the forest provide shelter to the resident animals, the Periyar Lake is the vast water resource, which quenches their thirst anytime and every time. The national park and the tiger reserve is rated as one of the best wildlife sanctuaries in India for wildlife photography, bird watching & elephant watching. 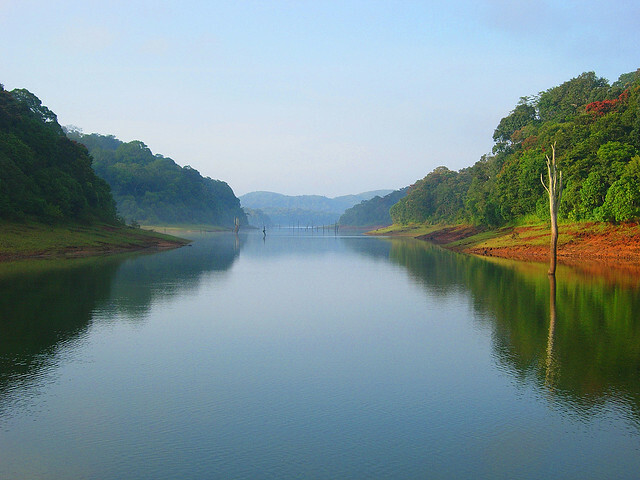 Periyar Lake: The Periyar Lake attracts grey heron, ibis, the great Malabar hornbill and grey hornbill. The other birds include kingfishers, ospreys and kites as well as orioles, hill mynas, racket tailed drongos, parakeets, including the unusual blue winged parakeet and flycatchers. Kumily: You can go for a short excursion to Kumily, just 4-kms away from Periyar. The former spice trade centre, the town is still growing the spices largely. Boat Cruises: The best way to explore the nook and corner of the Periyar National Park is through Boat Cruises in the early morning or evening hours. The Periyar Lake provides an excellent boating spot to the tourists where one can see the herds of elephants, bathing animals and even the herds of deer. Apart from the boat cruises on the lake; one can also enjoy the treks to the ruined Mangala Devi temple – an age old beautiful old stone temple amidst the Thekkady forest. Jeep and elephant safaris can also take you through the offbeat tracks. A morning ‘trek’ can also be equally rewarding for game watching. You can discover the wildlife as well as the pug marks while on your jungle tour.